I first saw this little Leprechaun on a Ledge on one of my favorite craft blogs, I am Momma Hear Me Roar, a couple of years ago. Last year, I knew it was time to make one of our own! The Leprechaun on the Ledge is sort of like Elf on the Shelf that people do at Christmas time. Our Leprechaun (whom we affectionately call Beardy) awakens in the night and pulls pranks or finds himself in silly or precarious situations. The kids think he’s great! 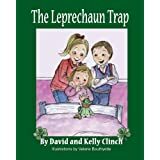 We even bought this St. Patrick’s Day book from Amazon that goes right along with it. Here is Beardy last year, when one night, he took a selfie with all his pals with our camera! I used the same pattern pieces from Make it and Love it, as Cheri did, to make the doll and the shorts too. I added the suspenders, bow tie, and the buckles on his shoes. I painted on his mouth and glued on his yarn hair with hot glue. I just guessed on how to make the hat. I am not a professional sewer (sewist? seamstress?) so I gave it my best shot and I thought it turned out pretty cute. I always think that St. Patrick’s Day needs a little extra something and I think Beardy does just that for our family! Can you tell that the kids love him? (oh, how I love that smile!) Do you have any fun St. Patrick’s Day traditions for kids? *This post contains affiliate links. For more information see my full disclosure statement here. Thank you! This sounds exciting! What a great idea! Thanks for linking up to Funtastic Friday and sharing with us. Hope to see you again this week. What a great tradition! He is so cute and fun!! I would be honored if you and your creative mind stopped by Totally Terrific Tuesday and linked up! I would love to use this in a round up I am doing! Have a wonderful weekend!! Thanks Jess! The Leprechaun on a Ledge is all linked up to your Totally Terrific Tuesday. I would love you to use the Leprechaun in a round-up too. Thanks! Clever idea! I love how you created the beard out of yard. This reminds me of dolls my mother use to make me as a child.